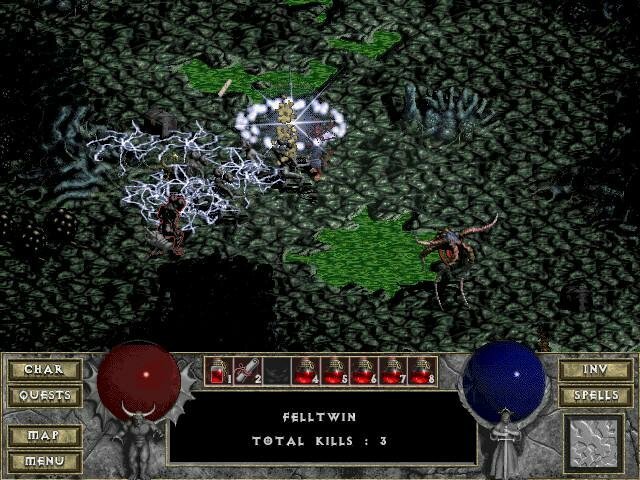 Hellfire is an expansion pack that folds itself into Diablo, adding new monsters, items, quests, dungeons and a fourth playable character. The expansion tells the story of Na-Krul, a powerful demon imprisoned by none other than Diablo and now unleashed by a wayward mage. 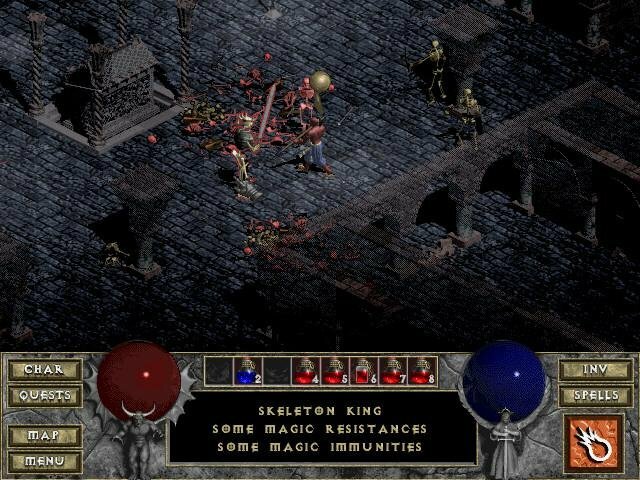 Hellfire has since been disowned by Blizzard, its storyline and characters denounced as being non-canonical. This expansion pack adds two new dungeons: a hive-like structure that’s analogous to the Caves, located on the edge of town, and a crypt which holds Na-Krul himself, found near the Monastery graveyard. 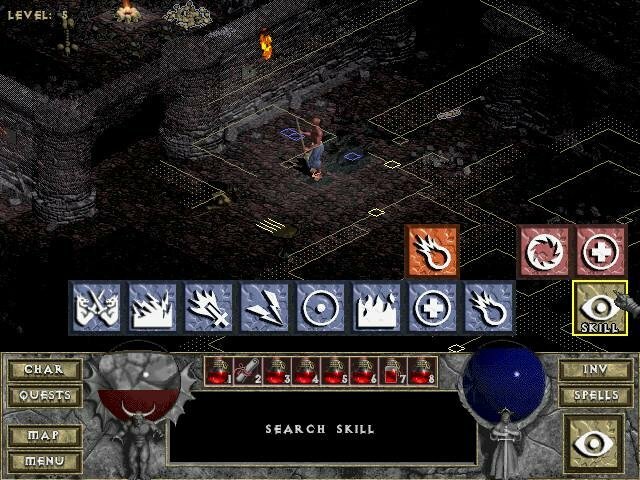 These two dungeons aren’t immediately available as your character will either have to reach Level 15 or at least gain access to the Caves. In either case, Lester, the town’s new expansion character who hangs around his herd of cows, will ask you to explore the Hive and clear it for him, triggering the first major expansion quest. There are also many other smaller trinkets and features. The improvement I’m most thankful for is the increased walk speed, which can now be doubled in town. No more endless walks to the witch and back! Several new spells have been added (including one that highlights dropped items) along with a brand new character – the Monk. Not the altar boy sort of Monk, but rather of the eastern kung-fu variety, one who’s extremely proficient with staves and hand-to-hand combat. He’s also pretty good at magic, making him very deadly once he finds a proper magical staff. 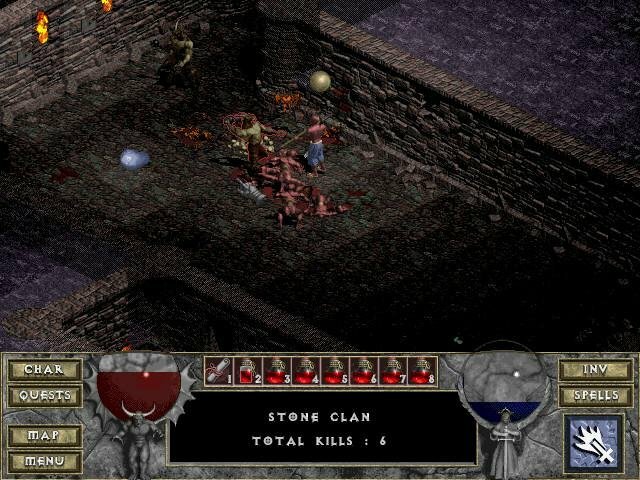 Synergistic added many items of their own while salvaging bits of this and that which were dropped during Diablo’s own production. Oils and runes are two such examples. Runes work as usable traps while oils can be used to either repair or upgrade your items. 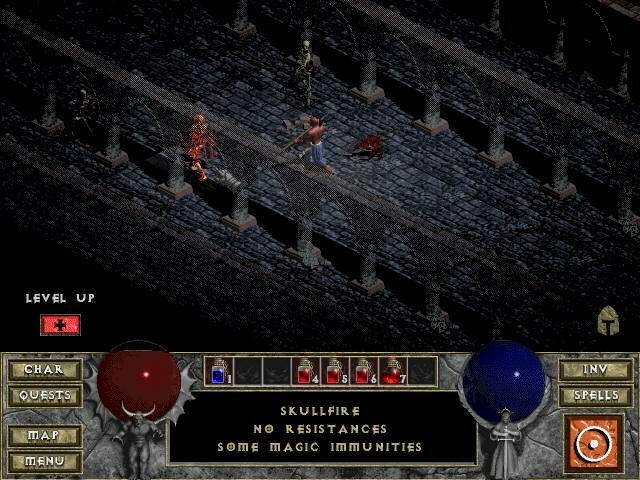 One quirk which also plagued Diablo makes a comeback in Hellfire. As before, there’s no proper way of storing items other than simply dropping them on the ground, which is a pretty inelegant way of depositing your extra gold and gear. Your stuff never disappears, permitting almost endless storage capacity in town. Also awful is the duplication bug, which has yet to be fixed. Yet this game’s most crucial oversight is its utter lack of online and local multiplayer. 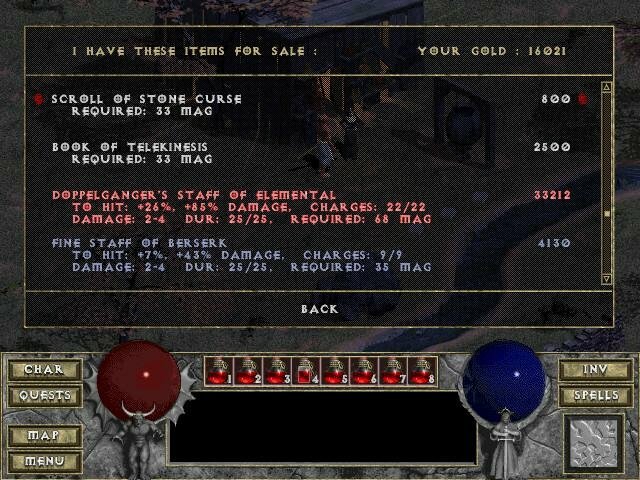 Online play is what made Diablo great and so I can’t imagine why this pack dropped it completely. 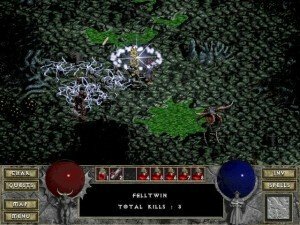 To partially compensate, single-player mode now allows for Normal, Nightmare and Hell difficulties, thereby permitting adventurers to find the rarest items. Still no substitute for a proper multiplayer match, but better than nothing. Here’s the Complete Nut. Dare you venture into the Hive and retrieve his prized jersey? Two new quests will be unlocked. The first of the lot is the hilarious cow quest. 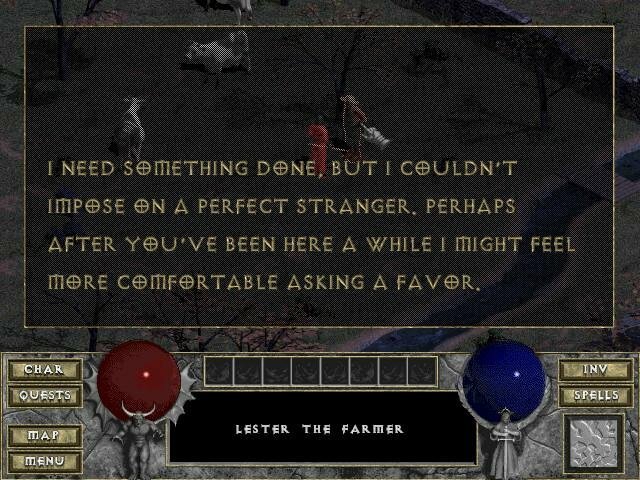 Here, Lester the Farmer gets replaced with the Complete Nut, a bizarre character in a cow suit who, like Lester, will only ask for your help once you’ve reached the Caves. When he’s willing to talk to you, the Complete Nut tells a bizarre tale of how he lost his prized Brown Suit in the Hive, and asks you to retrieve it for him. Practically speaking, the cow quest mirrors Lester’s own quest with one vital exception. Finding the Brown Suit and returning it to the Complete Nut wins you the coveted Bovine Plate, an indestructible suit of armor that grants a whopping 150 AC. 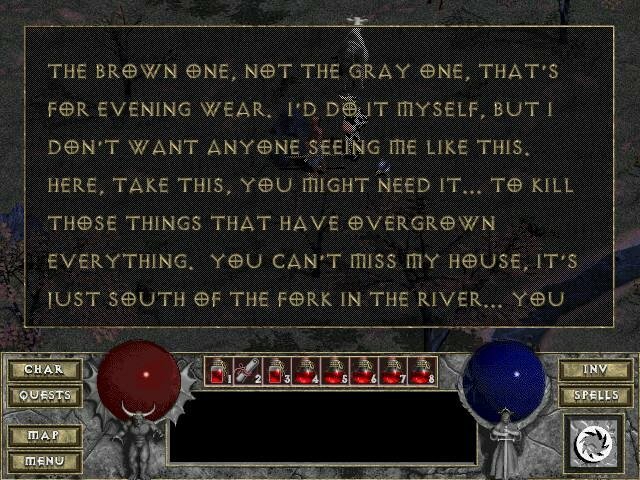 A great unique if you have the stats for it, but listening to the Complete Nut’s ramblings is its own reward. The second hidden quest is triggered after entering the Hive. 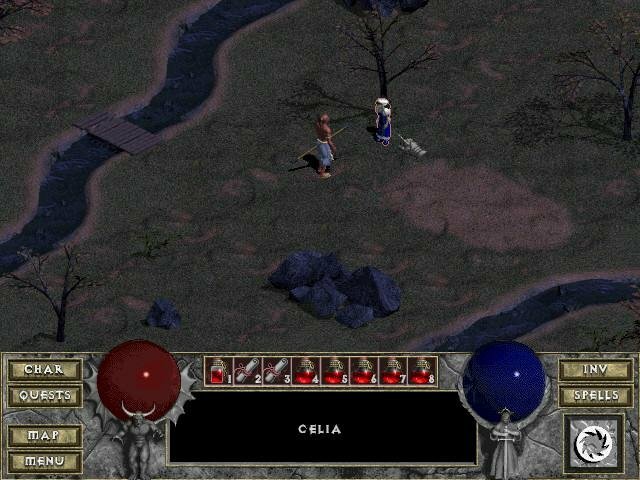 On your return trip to Tristram, you’ll find a little girl named Celia standing near the witch’s hut. She’ll ask you to retrieve her lost toy from the Hive, and will reward you for your troubles with a unique amulet. It’s worth pointing out that Celia adds nothing new to the game, as you’ll find the same amulet in the Hive regardless. Why they’ve decided to remove this quest is anyone’s guess. Supposedly, looking for children’s toys doesn’t exactly fit the theme of the original. Other minor additions that can be unlocked through command.txt include two new playable characters, namely the Bard and the Barbarian. These were test characters that never got fleshed out, and hence use the default skins and sounds of the Rogue and Warrior, respectively. They do have different weapon and stat proficiencies. it’s a shame Synergistic wasn’t allowed enough time to properly implement these characters. 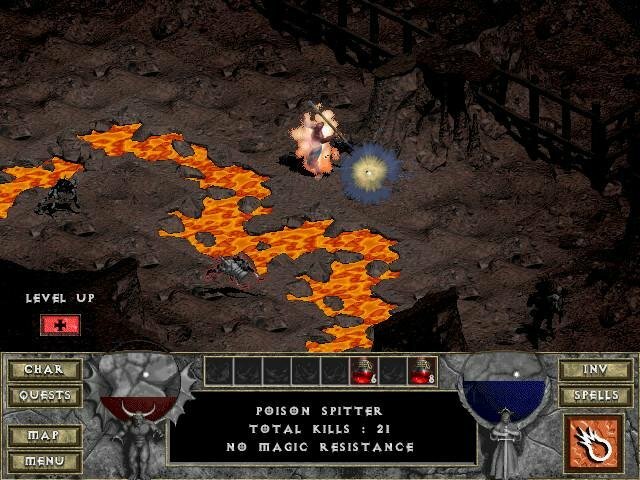 Maybe Hellfire requires the original Diablo cd to be mounted. Can’t remember. Yeah, the link I gave above had a superb installer. I’ll reupload, but the CDs on this site will work if you install it correctly. So…. Its bad luck for me coz I use win8 pirated ver. No other way to avoid that CD requirements? So everthing works perfect until I select my hero and click what type of game ill play (normal, nightmare or hell) then my screen turns black and nothing happens. The game is running but not on the screen. 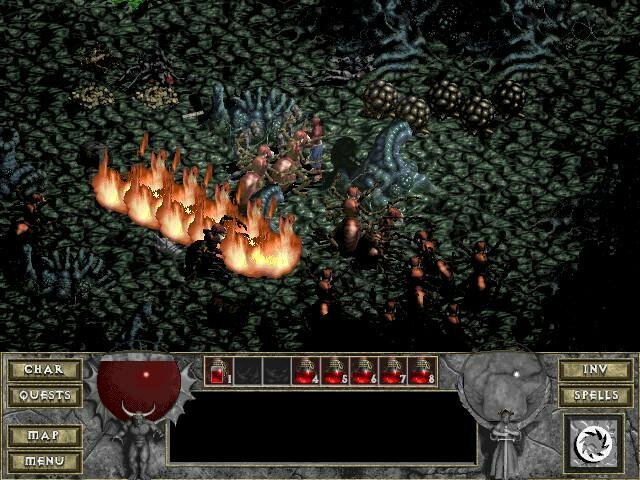 any help..
Hellfire is all the same as original Diablo from beginning. Where new levels, story begins? Oh, sorry, i didn’t read all of the review. My bad. So I’m installing this on a Windows 10 computer, and upon running Hellfire itself, the game boots into a black screen after the first 2 cinematics (which are striped with black lines). 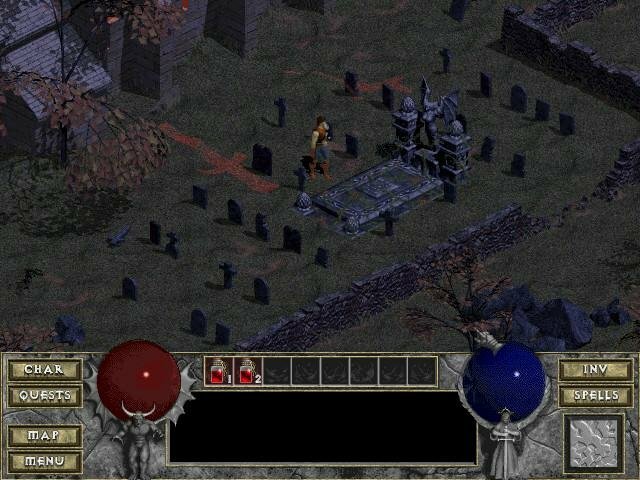 I realized I had this exact issue with base Diablo until I installed its own 1.0.9 update. 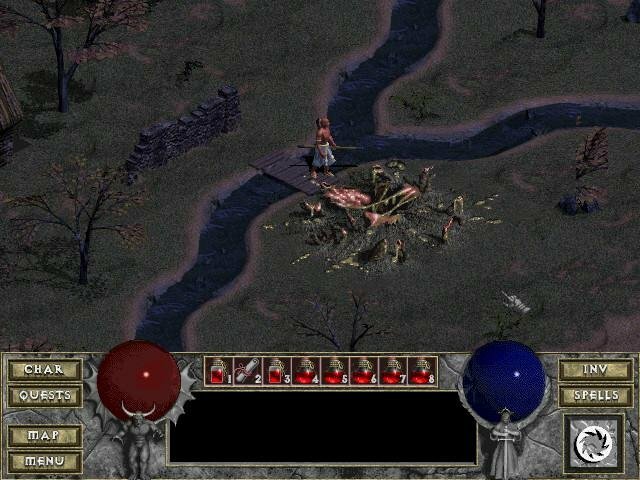 I’ve attempted to install the 101 patch for Hellfire, however I don’t know how to run it. Do I use the dll? blinky36, here is included not full patch. try to download patch from another page. help! I’m on windows 10 and I set the compatibility properties to winxp but I got black screen after the intro. Is it so hard to look at homepage of this site? There is answer for you in top of page. Just open your eyes and you will see “How To Run Old Games on Windows 7/8/10”.